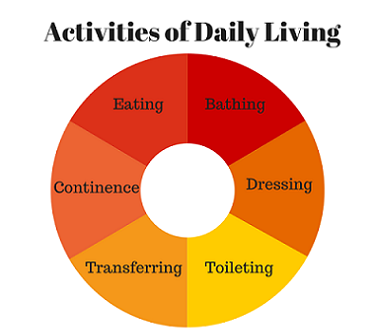 ADLs (activities of daily living): The things we normally do in daily living including any daily activity we perform for self-care such as feeding ourselves, bathing, dressing, grooming, work, homemaking, and leisure. The ability or inability to perform ADLs can be used as a very practical measure of ability/disability in many disorders. What are the Activities of Daily Living (ADLs)? There are many variations on the definition of the activities of daily living but most organizations agree there are 5 basic categories. What are the Instrumental Activities of Daily Living (IADLs)?